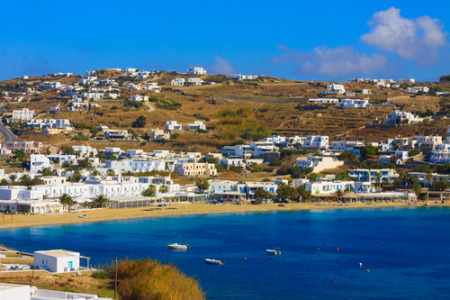 Agios Ioannis holidays take you to the south west coast of the island just five kilometres from Mykonos Town. Looking out onto the sacred island of Delos, it is said to have one of the most beautiful beaches on the island. With long stretches of sand interspersed with small coves, holidays in Agios Ioannis are particularly popular with families. The more active visitor can enjoy a variety of water sports which are available from the beach. Holidays to Agios Ioannis can be taken from April to October when temperatures rise from twenty to the low thirties at the height of the season. The south coast is always breezy which is very welcome when the mercury rises. If you are seeking a beautiful spot with sand and sea, good accommodation and choice cuisine, you may be tempted by our cheap Agios Ioannis holidays. Since our commitment to quality never wanes, they are considered to be excellent value. For further information and to discover our latest Agios Ioannis holiday offers, please use the search facility.